The first use of Italian peace flags in the United Kingdom which I have recorded was in November 2003, but they must have been used before that time as well. Since then, a number of variants have appeared. It seems that the flags with the inscription PEACE are used a bit more frequently than those with the inscription PACE, which are also used very much, perhaps even more than could be expected for an English-speaking country. It shall be noted that the colour shades might vary on the photos more than shown below, but much of these variations may be attributed to the pictures taking conditions, like the weather, location of the photographer, or the exposure time and other shooting parameters. This variant of the flag was used in London, at the protests against the USA President Bush's visit, on 2003-11-20. The photo was published in Serbian daily newspaper Večernje novosti ("Evening News"), ISSN 0350-4999, issue of 2003-11-21, p. 13. The colour pattern is: purple, dark blue, light blue, green, yellow, orange, red; word PEACE is inscribed in white over light blue and green. 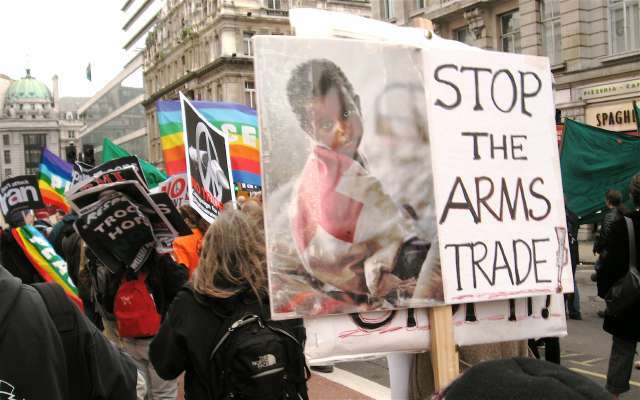 The flag was also used in London on 2007-02-24, at the protests against the war in Iraq (reports here, here and here). This flag was seen on a photo (link broken) from the peace march in London on 2005-03-19, which was taken before USA Embassy, and also at the protests against the war in Iraq, in London, on 2007-02-24. The colour pattern is: dark blue, light blue, purple, green, yellow, orange, red; word PEACE is inscribed in white over purple and green. Dark blue is a bit darker and light blue and orange are a bit lighter than on the previously described flag. The photo of this flag was taken at Headlington Hill, Oxford, on 2007-11-26. The colour pattern is: dark blue, light blue, very light blue, green, yellow, orange, red; white word PEACE is over very light blue and green; the colour shades are very similar to those from a flag seen in Italy (image), with the exception of dark blue, which is lighter and inclines more to violetblue here, and yellow, which is darker than on most of other flags. The photo of this flag was taken at the G8 Make Poverty History demonstration in Edinburgh, July 2005. The colur pattern is similar to that of the previously described flag, but only the shade of red is the same on both flags, while yellow and orange are lighter and all other colours are much darker on this one. A flag with a unique inscription, where a peace sign is added before the word PEACE, was flown in Chirk, near Wrexham, Wales, at the protests against the event named Dragon's March Army Recruitment Fair, on 2006-05-23 and 2006-05-24 (photo, photo, photo). The same flag was flown at the anti-war protests in Wrexham on 2007-02-24 (photo) and and in Aberystwyth, Wales, on 2007-02-20 (photo). The colour pattern used here was: violet, dark blue, light blue, green, yellow, orange, red; the white inscription was over light blue and green. Yellow is lighter than on other described flags, while other colours - except violet, which appears only here - have shades somewhere in between the darkest and lightest shades recorded. The obvious variations of the colour shades on the photos given as the sources above, and on many others available at the same site but not listed here for the sake of brevity, may be attributed to the pictures taking conditions, like the weather, location of the photographer, or the exposure time and other shooting parameters. This flag was used in London on 2007-02-24, at the protests against the war in Iraq. The colour pattern is: purple, dark blue, light blue, green, yellow, orange, red; word PACE is inscribed in white over light blue and green. Used at the same occasion as the previous variant. The colour pattern is: dark blue, purple, light blue, green, yellow, orange, red; word PACE is inscribed in white over light blue and green. Dark blue and orange are a bit lighter than on the previously described variant. Used at the same occasion as two previously described variants. The colour pattern is: dark blue, light blue, purple, green, yellow, orange, red; word PACE is inscribed in white over purple and green. The colour shades are the same as those of the previously described flag. Used at the same occasion as the previously described variants (reports here and here). The colour pattern is: dark blue, light blue, very light blue, green, yellow, orange, red; white word PEACE is over very light blue and green. The same colour shades as on the flag with the word PEACE, which was seen in Oxford on on 2007-11-26. Used at the same occasion (photo) as the previously described variants. The colour pattern is: purple, light blue, green, yellow, orange, red, dark blue; word PACE is inscribed in white over green and yellow. Very similar to a flag seen in Italy (image), only with most of colour shades lighter. Although the flag is not completely visible on the photo, the size of part hidden behind a demonstration poster reveals that there is not enough space for word PEACE, so the inscription can only be PACE. Flag variant charged with an additional peace dove was photographed in London, at Trafalgar Square, on 2007-04-30. The photo is available here: https://www.flickr.com/photos/scarcely/484122596/. The color pattern is: very dark blue (indigo), dark blue (inclining towards medium blue), light blue, green, yellow, orange, red. Word PACE is inscribed in white over light blue and green. A white peace dove is placed on dark blue stripe, above the letter E.